Corrib Village – This is a 3 story townhouse with rooftop terrace situated on the very popular Pratumnak Hill. The house is within its own secure village and comes with private parking carport and communal swimming pool. 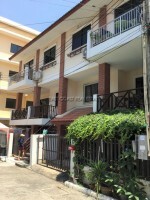 Within walking distance to the beach and many local amenities such as shops, restaurants, bars and a local Thai market. Close to Walking Street and Sukhumvit road. The house is well built by western builders and furnished to a good quality. The rooftop terrace of this two bedroom townhouse can be easily converted into 4 bedrooms at low cost increasing the rental yield of the property. Houses of this type on Pratumnak Hill are renting very easily and rarely left empty, making for an ideal investment opportunity or family home. The title deed is held in a Thai company name but the company is not sold with the property. Transfer fees to be split 50/50. Also available for rent with a minimum +6 month contract at higher price. Advertised price is for a +12 month contract.